Welcome Ramadan in with EXCITEMENT! I am super excited to be sharing this with you. 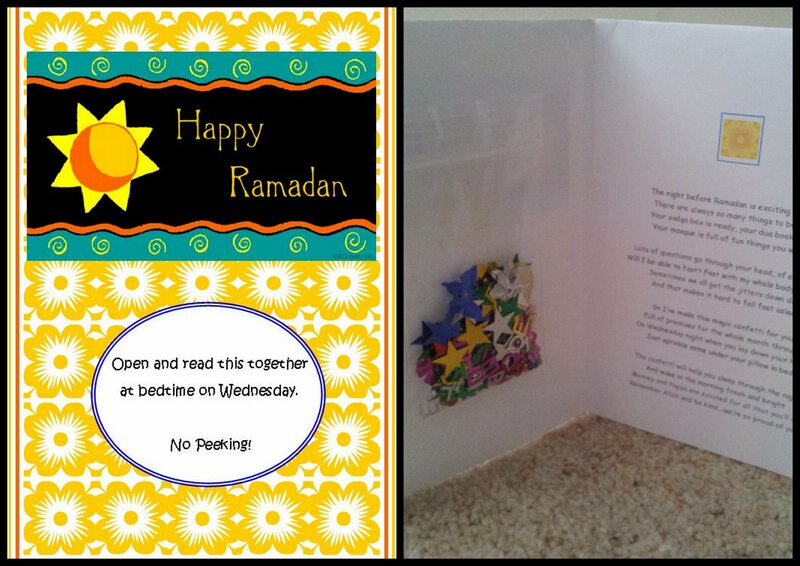 Inspired by this post on an idea to welcome the school year (http://sunnydaysinsecondgrade.blogspot.co.uk/2011/07/ready-confetti.html), we have come up with with a Welcome Ramadan card and poem for children! Will I be able to fast? Fast with my whole body and mind? It’s a FREE download! Simply print it off, fold it, and stick on a teeny weeny bag of confetti inside – then cuddle up to your children tonight, open it and share a special moment welcoming this month in, Inshallah! P.S. If you’re like me, you may want to keep a hoover/brush pan nearby for afterwards! P.P.S. If you do this, do share your experiences!